solid spiritual life to your children if you don’t have time to pursue one yourself? I felt stalled in my spiritual growth by the busyness of life with her toddler, so I embarked on a yearlong journey through ten spiritual disciplines: prayer, fellowship, submission, study, simplicity, silence, worship, fasting, service, and celebration. As I focused on each discipline, I discovered practical ways to observe them—even in the chaos of the everyday. Mom Seeks God offers a highly relatable story and useful advice to help new moms grow in their faith as they address life changes with grace, patience, and prayer. As readers discover ten essential faith practices, they’ll learn that motherhood, itself, is a spiritual discipline, and may be God’s most effective technique for forming a more Christ-like life. The book is one of Christian inspiration and growth. 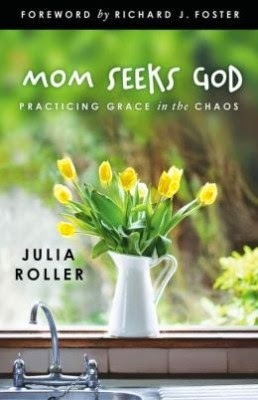 Julia writes about her struggles as a mom and how to keep her spiritual life active while being a mom. The book offers practical advise to help anyone grow in their faith while they go through lifes experiences. This book I would recommend, not for just mothers, but for anyone that struggles with trying to fit God in with their daily struggles of life. I thoroughly enjoyed it. *Purchasing through this affiliate link will help Mom Loves 2 Read continue to blog and grow - as we receive a tiny portion of the cost through the Amazon Affiliate Program.